After a government agent dies by drowning, C.W. Crawford (Alan Fudge) asks Mark Harris (Patrick Duffy) to go undercover to expose two carnival workers as criminals working on a caper to rob a bank. Mark also begins to develop romantic feelings for the carnival’s owner, Charlene (Sharon Farrell). 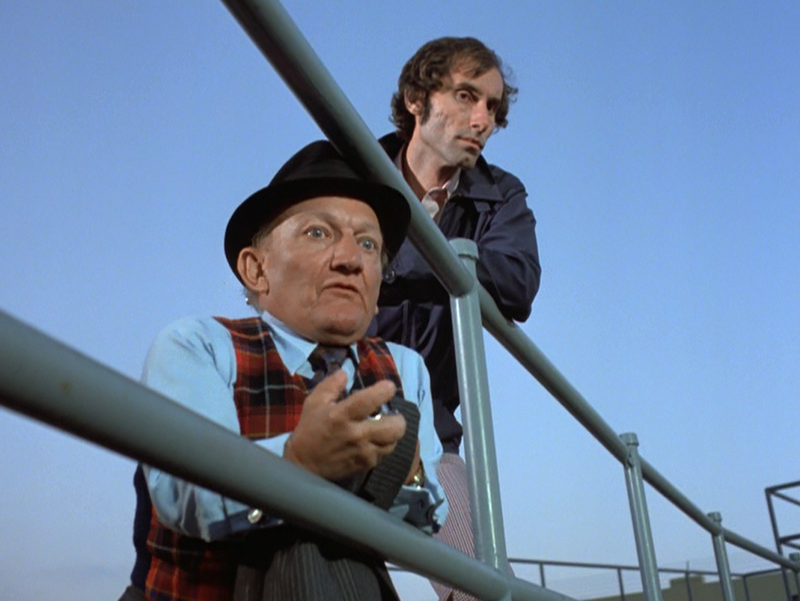 But he soon falls in with Moxie (Billy Barty) and his evil henchman, who can harness electricity (Anthony James). 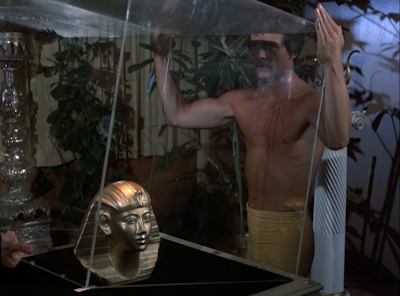 Their real plan is not to rob a bank, but to steal a golden mask of an Egyptian pharaoh from the nearby Chadway Museum. “Deadly Carnival” is the last episode of Man from Atlantis (1977-1978) and it features several elements that I both love and dislike about this short-lived genre series. 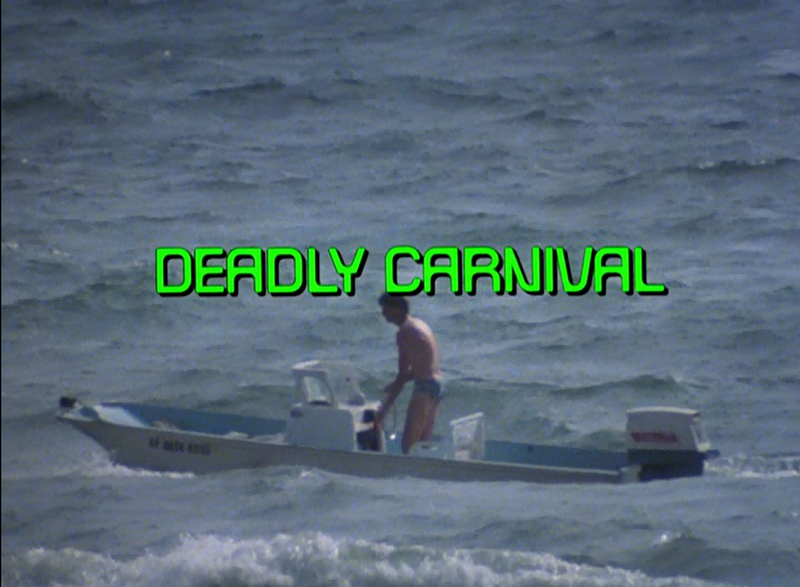 In terms of what I love, “Deadly Carnival” includes a short, almost throwaway scene of Mark Harris sitting alone on a Ferris Wheel by the sea. He just sits there by himself -- happy -- trying to assess what he feels about the ride, and about the world where he lives. The character's isolation or distance from humanity is perfectly captured in terms of visualization. 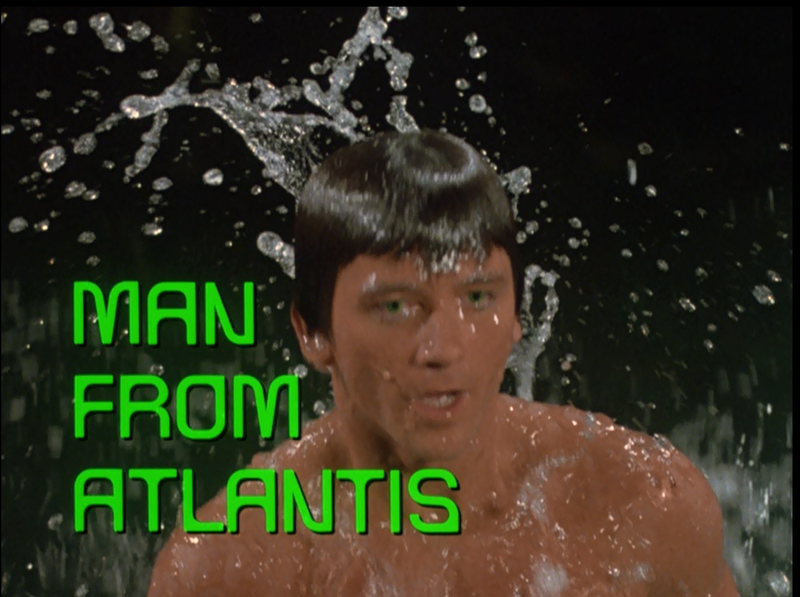 Even when the series is at its worst, Patrick Duffy brings a genuine humanity to this “fish out of water.” The individual episodes may not be terrific, but Mark Harris is a classic character. 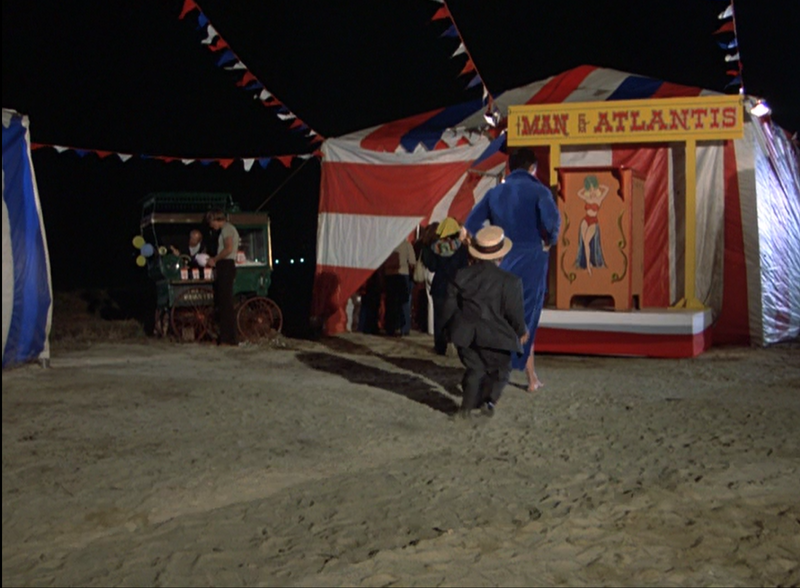 In terms of what I dislike about the series, “Deadly Carnival” doesn’t feature much innovative or intriguing in terms of its narrative. 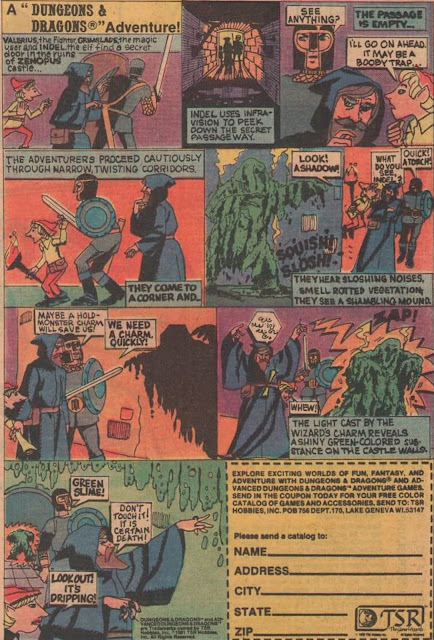 It’s just a basic “hero goes undercover to stop a robbery” story that could have happened on any number of seventies series, from The Six Million Dollar Man to Wonder Woman. Worse, the series seems to be in the process of dismantling itself here. We don’t get a last look at the Cetacean, and Elizabeth and Jenny are both gone. 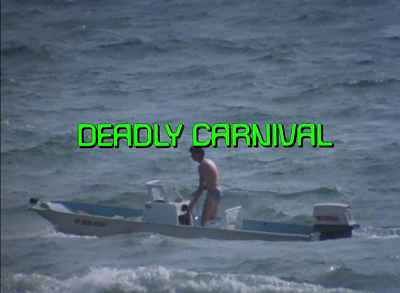 Although Mark Harris experiences a bit of a romance here (which contradicts his first ‘romance’ that we saw in “The Death Scouts,”) there’s still a general feeling in "Deadly Carnival" that the show has come to its end. Bafflingly, Mark Harris tells Charlene in this story that he spends most of his time seeking out his origins. I truly wish that had been the case. I wish the series had focused on exploring the oceans, and picking up the trail to Atlantis, and Mark’s real identity. Instead, the series vacillated between Batman camp in the Schubert episodes and strange, incoherent fantasy stories (“Imp,” “C.W. Hyde.”) Re-watching Man from Atlantis today, one can’t help but mourn the squandered opportunity. This is a series that headlined a great character, and had a great star portraying him. And the best the writers could do was have him combat evil twins, or go undercover at a criminal carnival.